Tea is the second most widely consumed beverage worldwide, following only water. In 2015, global tea production amounted to about 5.2 million metric tons. China, India, Kenya, Sri Lanka, and Indonesia were among the main tea producers in 2016, based on production volume. China was responsible for about 50 percent of total tea production with 2.35 million metric tons that year. When it comes to trade, the Russian Federation was leading tea importer, with about 548 million U.S. dollars in trade value. Total wholesale tea sales were estimated to amount to 12 billion U.S. dollars in 2016. 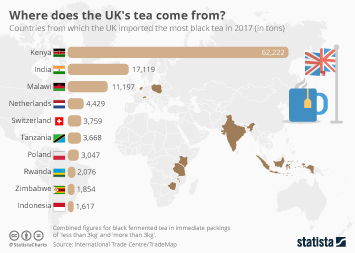 The tea market comprises four broad segments: ready-to-drink tea (RTD), the traditional market, the specialty segment and the foodservice segment. The RTD category increased consumer penetration over the past years and continues to be the largest market segment. The leading RTD tea brands were Arizona, Lipton Pure Leaf, and Gold Peak in 2017. Although coffee is often thought of as America’s preferred beverage, tea has proven itself to be vastly popular as well. A 2017 survey among U.S. consumers showed that 23 percent of respondents drink tea every day, while only ten percent never drink tea at all. Industry experts expect the entire tea market to grow over the next years. Increasing health awareness among shoppers, new flavors and the demand for convenience are seen as major growth opportunities. Imports of Fair Trade tea into the U.S.